Can someone teach me macrame? I’m a glutton for punishment, some would say self abuse, and need to find another hobby when I’m done with the Te Araroa. Who am I kidding. I love tramping and could never stop. Why I say all this? Another start to the day and more climbing to content with right from the get go. It was misty start to the day with the surrounding mountains veiled in fine cloud. The wind toying with me as it funnelled cloud up the steep valleys, shrouding the hill tops and only offering fleetingglimpses of the peak tops awaiting. Like so many of my big mountain days so far it was looking like views would be few and far between. A shame really as I know the surrounding country is amazing. There is no point in staying put to wait for clear weather though. Time is of the essence in the Richmond Range and while it wasn’t raining or windy I needed to make best use of my day. I was aiming big again today with the intention of pushing through 19km of rugged mountain tops, mostly above the tree line with my sights set on summiting Mt Rintoul and reaching the hut of its namesake, Rintoul Hut. Straight from Starveall Hut the trail climbed 400m up and up and up over a kilometre and a half to the exposed top of Mt Starveall at 1511m. I’m loving the hills and am making short work of ascents now. Reaching the top the trail lead down again, following a narrow ridge line, entering a world of stunted beech trees with little understory to speak of. Pale green beards of moss hung from the branches, swaying in the cool breeze. 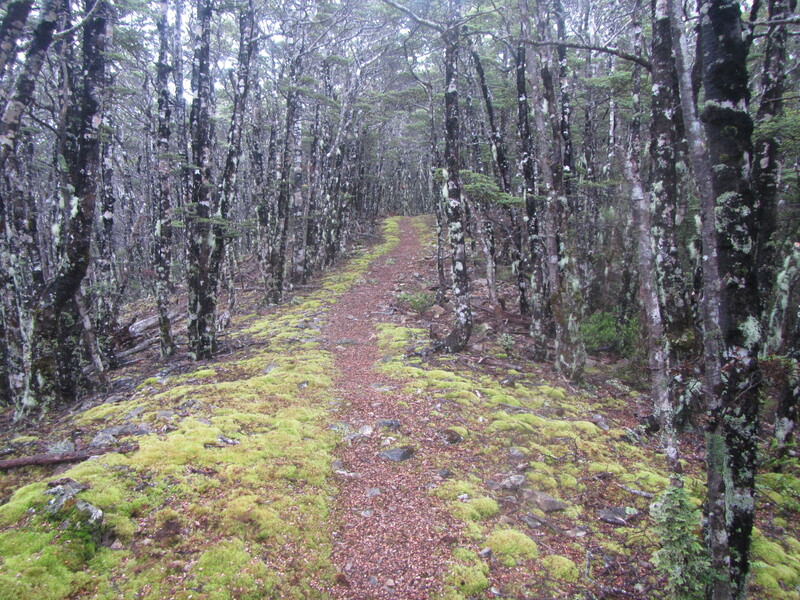 The path was narrow and lined with different, thicker ground mosses either side, revealing an obvious foot pad in the cetre, covered in the orange and brown hues of decaying beech leaves. 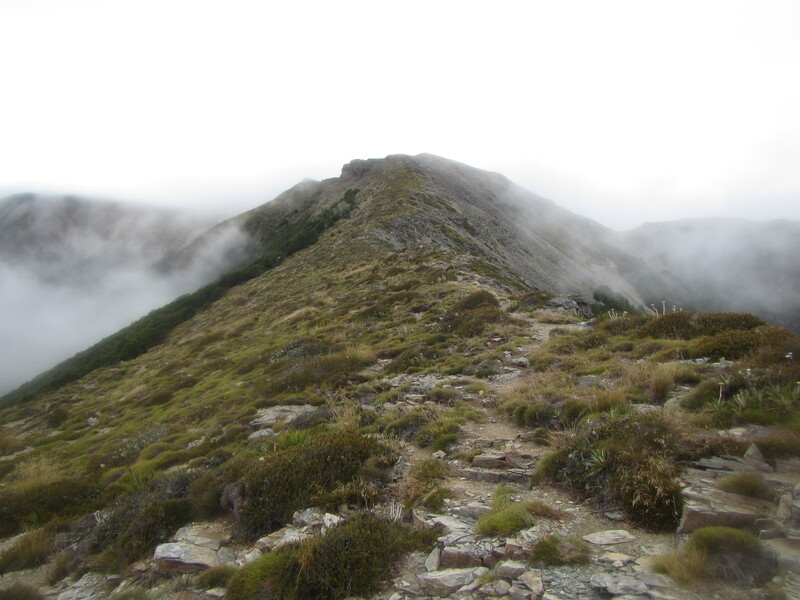 Down the ridge line descended over 3 kilometres on a good grade to Slaty Hut. I had a brief morning tea at Slaty and continued onto the high ridgetops. From Slaty Hut the first scree field was encountered but it wasnt too bad. 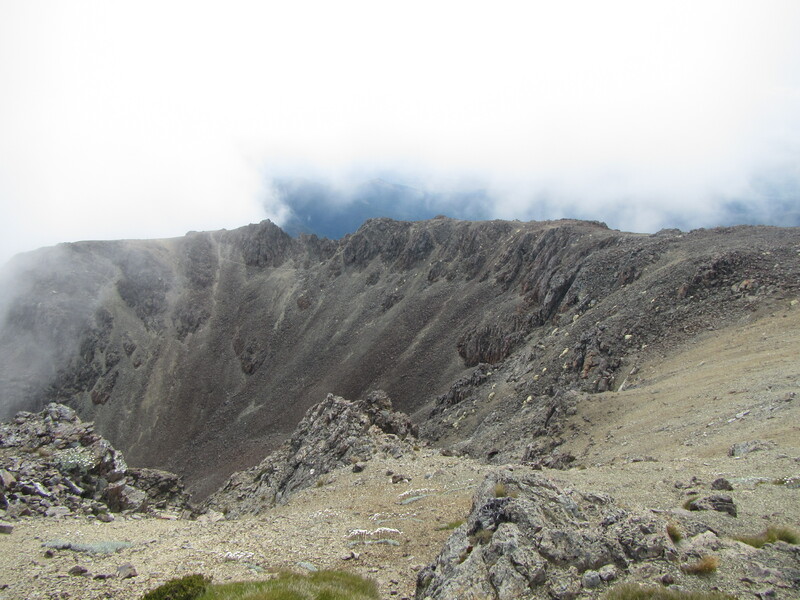 A short climb up and I was above the tree line again walking across exposed and rocky ridge tops. Sheer drops down on both sides but the trail stayed true to the knife blade ridge. The first true rock scrambles appeared towards Old Man Hill, several spots requiring absolute concentration to climb up rock slabs with a pack on, sheer drops down 10 metres or so. The low cloud causing moisture to settle on the cold rocks making for some slippery sections. A French guy took a tumble on this stretch of the journey only a week or so ago, having to be choppered out. It was with this in mind that I resolved to go slow and steady, summoning my inner mountain goat to keep traction. The trail picked through the rough ridge tops, winding in and out of boulders and the occasional rock scramble. It had nothing on the trails of south east Tasmania and my years of scrambling through similar terrain held me in good stead. I was in my element and walking through the sort of terrain I love. I reached the turn off to Old Man Hill Hut just before 1pm and stopped for a bite of lunch. The hut itself was off trail by a good 500m and 200m down slope. I wasnt intending to visit just for lunch and found a nice spot sheltered amongst the trees instead. I had plenty of time left in the day and was well ahead off all the DOC times indicated on signs, beating most by an hour to and hour and a half. But I would need the time for the upcoming section. The trail climbed steeply again up towards the summit of Little Rintoul. The climb wasn’t so bad but took time. It was the descent that was a killer. My first proper introduction to true scree and I cant say that I liked it. The path lead straight down for quite a way but it was slow going indeed. If not slow then it was super fast. The field of loose rock and slatey flakes would just shoot out from underneath my feet. Rocks the size of foot balls and some that I would struggle to lift, that would ordinarily be secure if you stepped on them would slide down just as easy as the little stuff. What looked to be good foot holds would slide down as if they had marbles underneath. Each step was slow and steady. I had one scare. Finding myself sliding for a couple of metres on the loose ground, my feet scrambled for a placement but on reaching one the rock slide out from underneath and I was airborne again. Feet flailing in the air, everything my feet touched moved. With gravity and a heavy pack my momentum kept building and I continued down slope at a rapid pace. I must have slide a good 10 metres. Phew, no broken ankles and a serious wake up call. Every single step for the rest of the day would be slow and considered. My walking poles remain my best friends, providing me with two extra feet and added security. At the bottom of Little Rintoul the trail sidled across a scree slope underneath Little Rintoul. Coming around the corner of a large boulder I met Imme from Denmark sitting on the ground and catching a break after a similar hairraising descent. Initially I thought she had an injury of some sort but all was well. It was the hardest section either of us have done so far. I was surprised to see anyone at all today let alone here in the middle of freakin nowhere. Ensuring that she was Ok I left Imme to climb yet again, on scree towards Rintoul itself. One step up, two back as the loose gravel cascaded down slope. 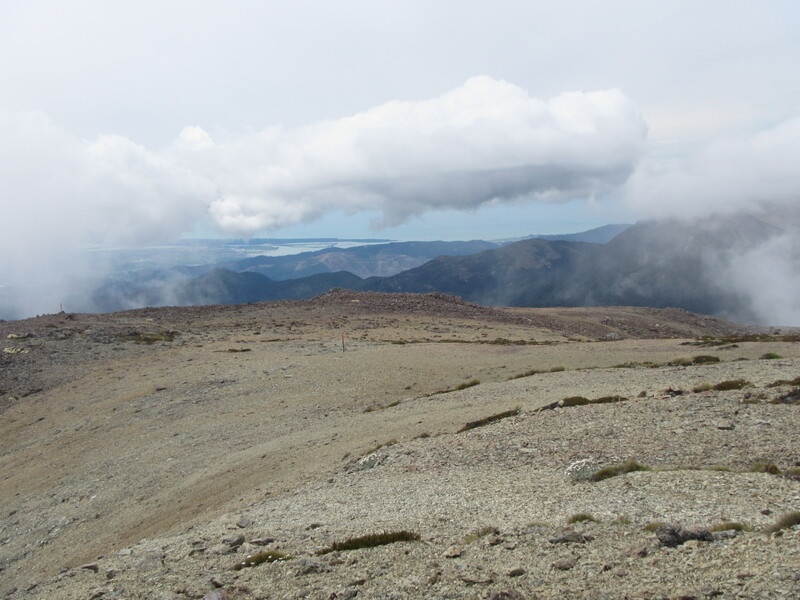 The cloud briefly lifted on the summit and treated me to views out to the coast and over the Able Tasman which was great. Perfect timing having had few views all day. I couldn’t wait for the day to be over but there was yet another scree descent down to the treeline and the hut. The danger was less on this descent but neither the less I resolved to go slow and make it down uninjured. Which I did. The descent took longer than expected and once into the trees just seemed to go on and on and on. Someone really needs to teach the kiwis a thing or two about switchbacks, as they love sending trails straight up and straight down. what goes up must come down….. then go up again.